FILE - Publishing director of the satiric weekly Charlie Hebdo, "Charb," displays the front page of the newspaper, in Paris, Sept. 19, 2012. Many of its cartoonists started in the 1960s on Hara-Kiri magazine, which openly proclaimed its aim to be “inane and nasty.” It was banned in 1970 after printing a mock death notice for General Charles de Gaulle, only to reappear months later under the name Charlie Hebdo. The racism case went to court in 2007, but the plaintiffs -- two leading French Muslim groups and the Saudi-backed Muslim World League -- stood no chance against the weekly's defense that France's freedom of speech and separation of church and state guaranteed its right to criticize any religion. Because of its relentless criticism of many public figures and institutions, Charlie Hebdo's often crude -- many Muslims would also say cruel -- caricatures are seen in France more as free speech rather than far-right, anti-Muslim agitation. Stephane Charbonnier, right, editor-in-chief of the French publication Charlie Hebdo, was interviewed in 2012 by VOA's Arzu Çakır. Charbonnier was killed in an attack that left at least 12 people dead, in Paris, France, Jan. 7, 2015. In a 2012 interview with VOA's Turkish service, editor Charbonnier had answered questions regarding the magazine’s take on an anti-Islamic movie called Innocence of Muslims. "This is a satirical paper produced by left-wingers and when I say left-wingers that goes all the way from anarchists to communists to Greens, Socialists and the rest. 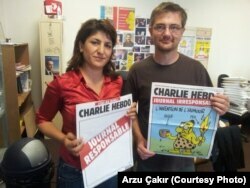 Above all it is a secular and atheist newspaper," Charbonnier told Reuters at the time. VOA's Turkish service contributed to this report. Some material for this report came from Reuters and AP.